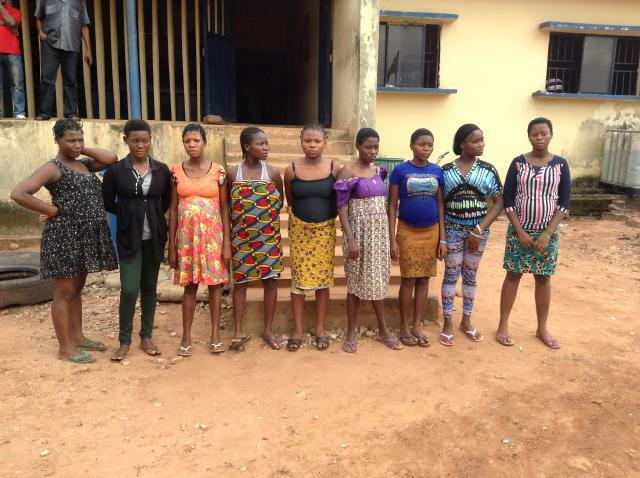 The ladies were identified as Stella James, 19, from Ohaozara, Ebonyi State; Eze Jennifer, 19, from Obukpa in Nsukka LGA, Enugu State; Ugwu Christabel, 17, a native of Aku, in Igbo-Etiti LGA, Enugu State; Happiness Mbaonu, 17, from Nnewi, Anambra State; and Ovunna Ifeoma, 20, from Ezza, in Ebonyi State, Esther Nwankwo, 21, a native of Nkalagu, in Ebonyi State; Onyedika Agu, 23, of Isuawa, Awgu in Enugu State; Blessing James, 23, from Ohafia, Abia State; and Chibueze Ujunwa, 24, from Aninri LGA, Enugu State. Onoh claimed that he got a provisional approval in October 2007 from the Ministry of Women Affairs and Social Development in the state to admit and shelter pregnant women in his hospital, known as Tex Hospital and Maternity Home, which is located at 9th Mile. He said he decided to keep the pregnant girls in his private residence when the said hospital was closed down. He admitted that he only notified the authorities through phone calls whenever he admitted any pregnant woman rather than follow the normal procedure of formally informing although the ministry within 24 hours of admitting them. Some of the girls told police that Onoh took care of them on the agreement that he would take the babies upon delivery. Christabel, who claimed she got pregnant after she was raped, said her aunt directed her to Onoh’s residence. She said her parents wanted to marry her off to an old man because of the ‘unwanted’ pregnancy. Another girl, Happiness Mbaonu, said she was impregnated by an unknown man who took her home when she was stranded at Holy Ghost Park in Enugu. This, she said made her seek for assistance through one of her relations, who directed her to the home. The police are still investigating the matter.